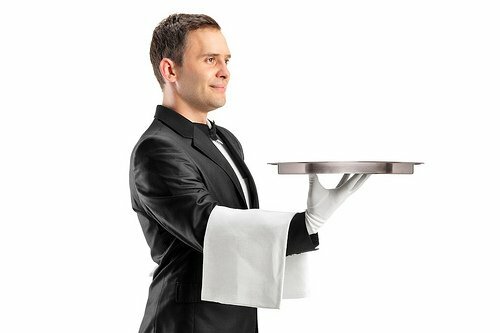 Service Costs > How Much Does a Butler Cost? How Much Does a Butler Cost? Butlers, often referred to as the house manager, will usually work with affluent families, politicians, celebrities, and related upper-class people. These butlers are often in charge of the household and will generally oversee other members of the staff such as the maids, chefs, gardners and chauffeurs. When it comes to a butler, there are a few ways that they are going to charge. It can either be by the hour, the size of the home or according to the services that are going to be required. For those who want to hire a butler full time for their home, the costs are going to hover around the $20,000 to $135,000 a year. This will depend on their experience, geographical location and the services required. However, if a butler is just required for some hourly work or the day, the costs of a butler can be around $200 to $1,000 for the day or $30 to $50 per hour, with a minimum hourly requirement. According to the International Butler Academy, a butler usually earns $50,000 to $150,000 a year, plus benefits such as room and board, a car, vacation time, phone and/or airline ticket home. GQ Magazine, for example, starts at $60,000 a year in countries such as Dubai with a shortage to as little as $40,000 a year in the United States. CNBC says the typical salary can range from $40,000 or $50,000 to as much as $200,000 for an experienced butler. A butler, often referred to as the house or staff manager, can vary in terms of the tasks given. This can range from arranging a dinner party to looking after a yacht. Other popular duties can include making travel arrangements, prepping dinner, cleaning, maintaining the budget, looking after visitors, doing the laundry, helping with the kids or directing other household staff members. A butler is either able to come by the day or they can live in the house with you. The average butler, if they were to live in the house, is often expected to work 40 to 60 hours a week. Tips are highly recommended. Some guests choose to give a tip on a one-time basis or as needed. It is considered standard for a butler who provides good service to get a tip equal to five percent of the room rate. Ultimately, it is the guest’s decision how much to tip their butler. If a placement service is used to find the butler, plan on spending a one-time retainer fee, which can be up to 15 percent of the butler’s cost.